Below is our second post summarizing the most notable watches we saw during our visit to Baselworld, the annual Swiss watch exhibition that completed its 2019 edition last week. The Bell & Ross BR 03-92 MA-1. The strap is dark khaki and orange, and is reversible. This super-clean pilot watch, Bell & Ross style, pays tribute to the U.S. Air Force’s 1958 MA-1 flight jacket, employing the same orange and dark khaki hues. 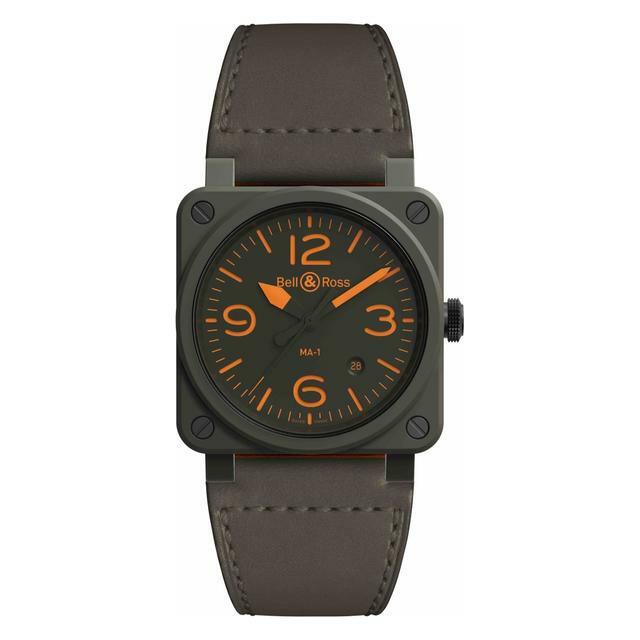 The 42mm dark-khaki ceramic case frames a sandwich-style dial with luminescent orange markers. The strap, echoing the same colors, is reversible. Inside is the Sellita-based BR Cal. 302 automatic movement. Easy, very cool and good-looking. Price: $3,900. 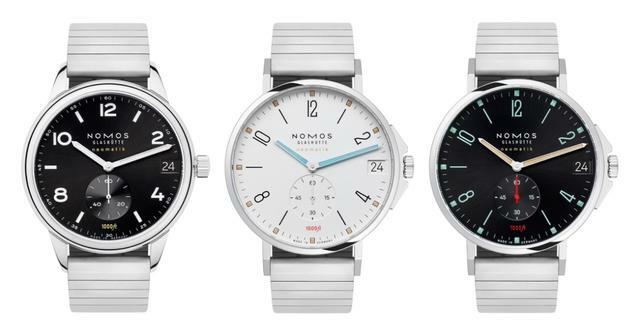 The three Nomos Sport Neomatic models, with a new bracelet, were Baselworld 2019 highlights. These two terrific bracelet models (one is offered in two colors) tick off two wholly new features for Nomos: a first-ever extra sporty case and a tough steel bracelet. The bracelet is the brand’s second, coming just months after the debut of a dress bracelet. The bracelet is user adjustable (use a screwdriver to remove links) with additional adjustments possible by moving the spring bars. The 42mm Tangente Sport Neomatik (in two colors) and the Club Sport Neomatik are both water resistant to 1,000 feet. Each watch sports strong marker luminosity and a superb in-house automatic movement, Caliber DUW 6101. 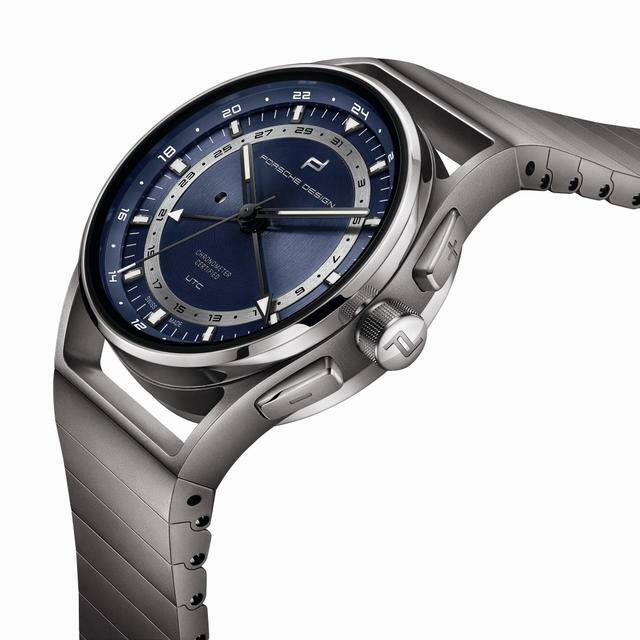 Prices: $4,060 (Club) and $4,980 (Tangente Sport, either dial color). 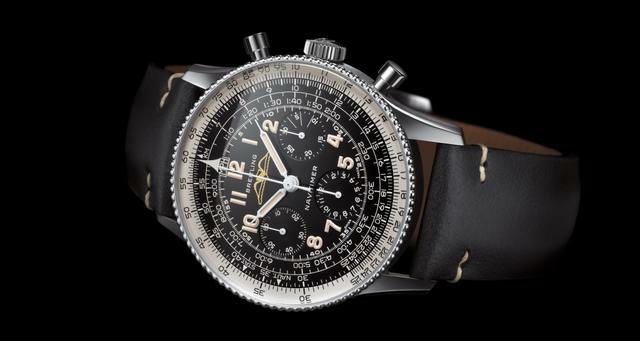 Breitling debuts the Navitimer Ref. 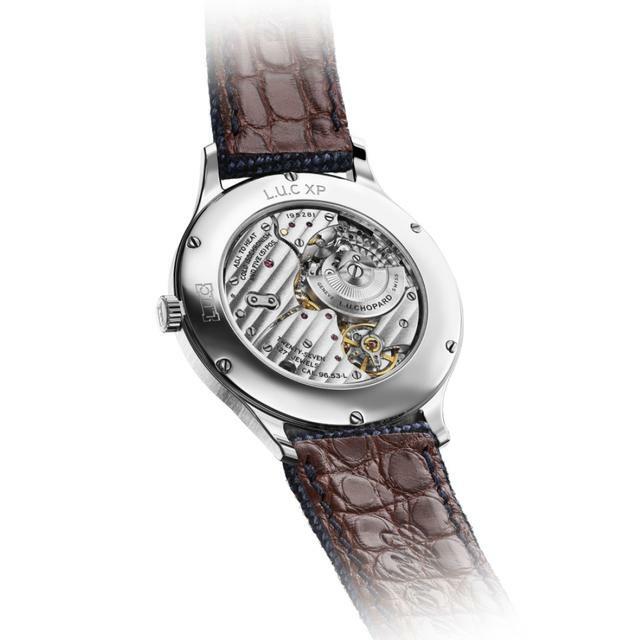 806 1959 Re-Edition, which recreates a favorite Navitimer design from 1959. The watch is a 40.9mm steel chronograph that replicates with very fine detail the 60-year-old design, including an all-black dial with tone-on-tone sub dials and a rotating beaded bezel. Even the famed slide rule is placed under domed acrylic glass, just like the original. Wisely, Breitling did increase water resistance to 30 meters, added SuperLuminova (in vintage hues) and fit the watch with a new manual-wind movement, Manufacture Caliber B09 (based on the excellent Manufacture Caliber 01), which is a COSC-certified chronometer. Price: $8,600. With a strong, broad set of debuts, Chopard in 2019 again shows off its abundance of technical and stylistic savvy. 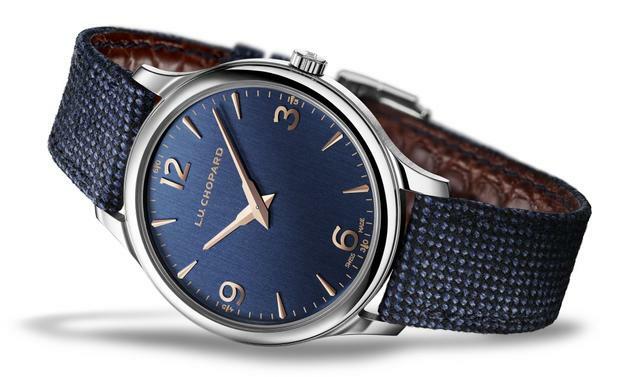 Even with a solid set of new masculine L.U.C Chrono Flybacks and a gorgeous L.U.C Flying T Twin (Chopard’s first flying tourbillon) to distract me, this pure dress L.U.C XP on a fashionable blue Merino wool strap caught my eye. It’s a 40mm steel watch with a satin blue dial that looks far better on the wrist than it does in pictures. The L.U.C XP’s rose gold accents, thin case and handsome caliber décor (visible though the caseback) made me swoon. Inside is Chopard’s estimable and beautifully finished dual-barrel L.U.C Calibre 96.53-L boasting fifty-eight hours of power reserve. 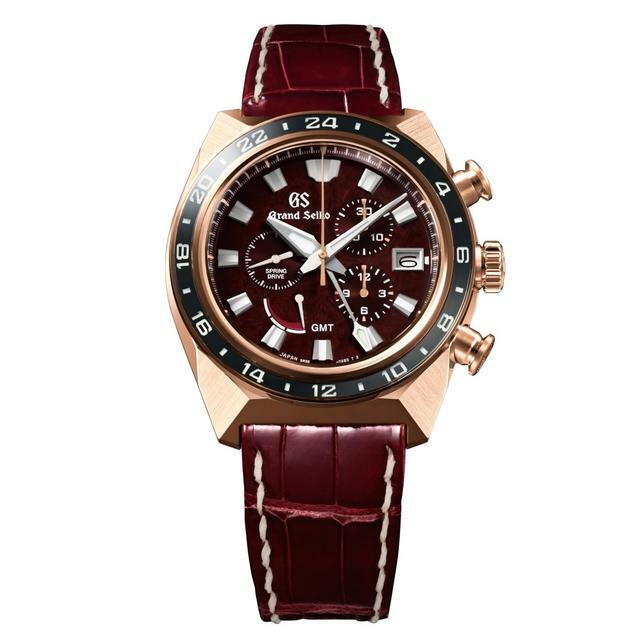 The added value here is that each watch arrives with a second cognac alligator leather strap with brown alligator lining. Price: $8,810. This sleek update of the company’s earlier world timer is both visually simpler and easier to use. When traveling, and after setting to the new location time, the user need only press the reset button to see the twelve-hour hand, showing original local time. To make it foolproof, a day/night disc serves as an a.m./p.m. indicator, helping the wearer set the time for the correct half of the day in the new time zone. The date, linked to the local time, automatically shifts forward or backward when necessary. The minute and home time displays remain unaffected by the reset. The 42mm titanium case is the epitome of modern. Inside, Porsche Design places a Dubois-Dépraz module on a Sellita automatic caliber base, certifying it all as COSC-chronometer rated. Price: $6,900. Available in two ten-piece Two Faces of the Moon limited editions, this set of deeply technical 44mm watches indicates the age of the Moon and its phases as determined by an extremely precise movement regulated using a tourbillon with fusee-and-chain (constant-force) transmission. 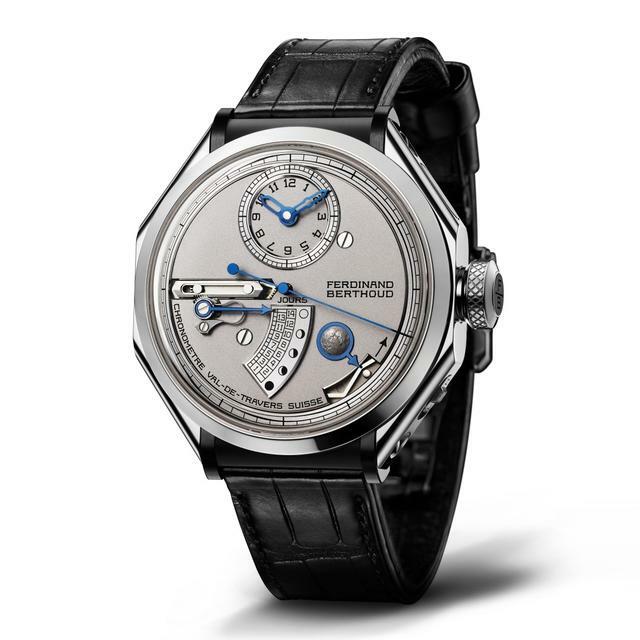 One model, showing the near side of the Moon, is made with a white gold case with black ceramic lugs; the other, indicating far side moon phases, is darker, made using grey ceramic titanium and sandblasted white gold. The displays show hours and minutes on a dedicated subdial at 12 o’clock, seconds in the center (driven directly from the tourbillon) and the fifty-three-hour power reserve on the back of the movement. A large hand at the lower left side of the dial indicates the age and phases of the moon in a continuous back and forth movement on an unusual plate marking the orb’s fourteen-day monthly full moon to new moon session. Combined here, for the first time, are a chronometer and an indicator of the age (waxing or waning) and phases of the moon, all within the same watch. 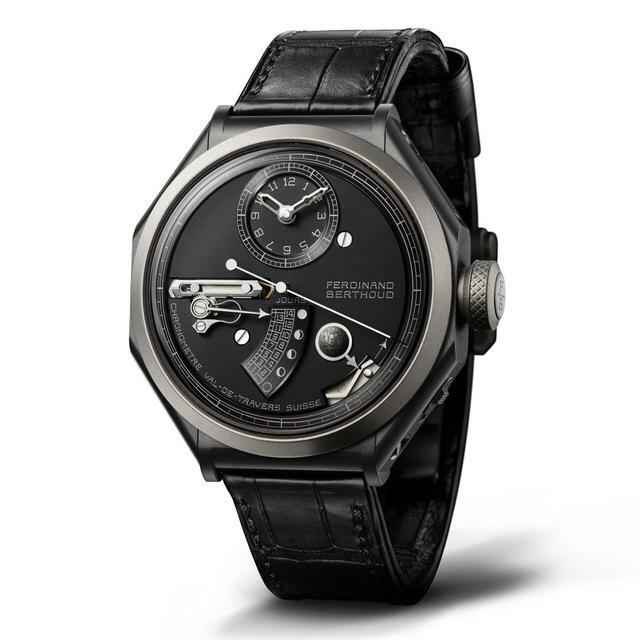 The Ferdinand Berthoud Chronometer FB 1L, in ceramicized titanium case, displaying moonphase on far side of the moon. 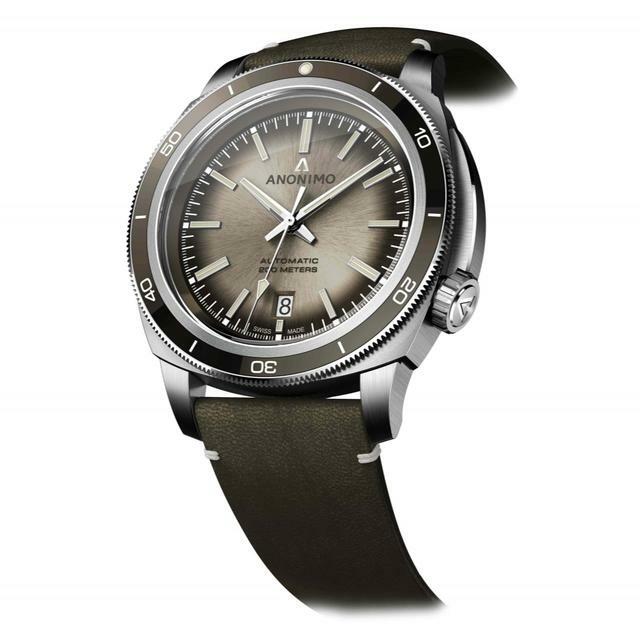 With one of the more affordable collections on display at Baselworld, Anonimo launches a tweaked Nautilo collection this year, with this chocolate sunray dial model one of the tastiest. Now measuring 42mm in diameter, with new railway markers, new hands and baton indexes, Nautilo broadens its appeal while retaining its strong dive flavor. 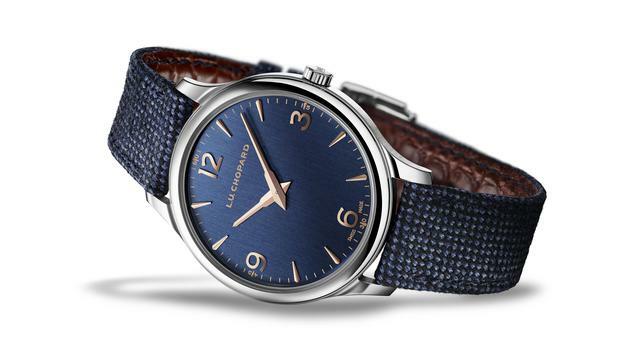 This heritage-based design also emphasizes a new, thinner bezel and allows wearers to change straps at will, though we’re not sure why anyone would replace this handsome kangaroo hide strap however. Inside is a Sellita SW200-1 automatic movement, visible from the caseback. Price: $2,290. 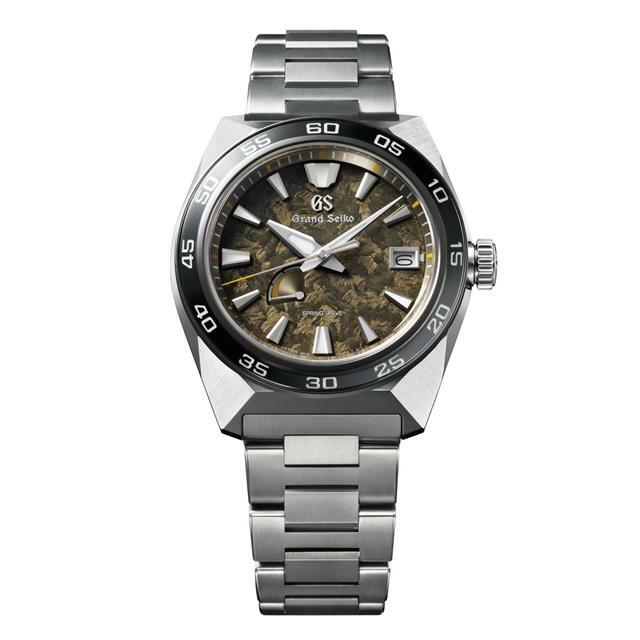 Casio's new limited-edition MRG-G2000GA features center links finished by swordsmith Sadanobu Gassan. For the serious G-Shock collector, this full-featured limited edition links historic Japanese metal work to today’s cutting-edge GPS technology. Japanese swordsmith Sadanobu Gassan finished the center links on this bracelet. His engraved rasp marks recall the philosophy of the Japanese sword while his inscription on the second link is Gassan’s family ode to sword forging. 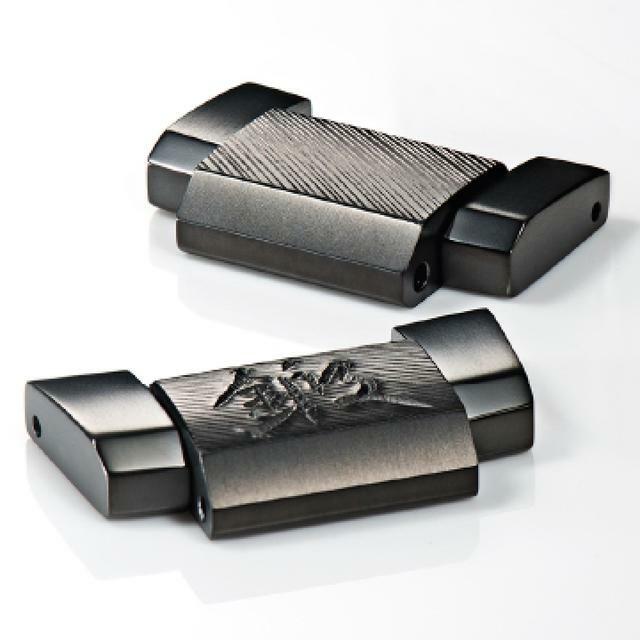 In addition, the hardened titanium case is meant to recall the look and feel of a tempered blade because the deep-violet color is the traditional Japanese color of heated and hardened steel. The engraved links on the MR-G G2000GA. 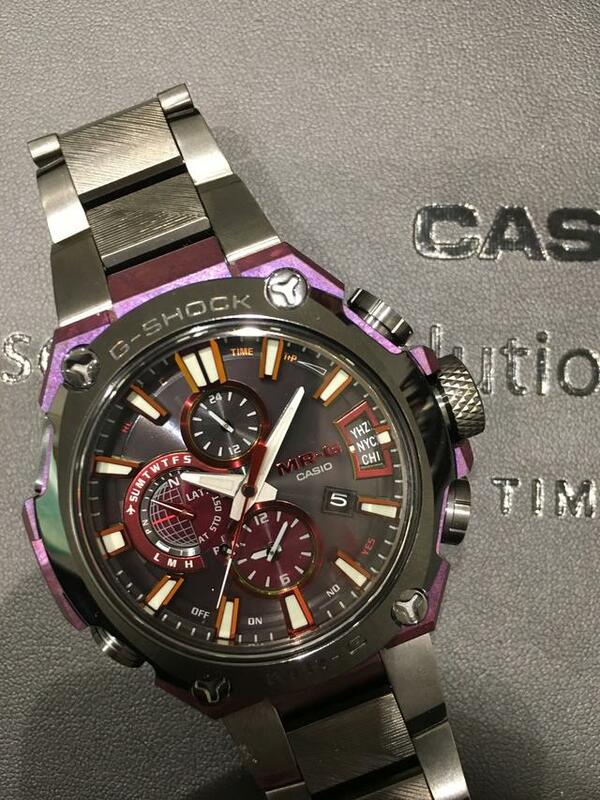 Inside of course are all the high-end G-Shock specs, including solar-powered GPS and radio-controlled timekeeping. On the side of the case G-Shock engraves “2019 LIMITED,” while the caseback includes an inscribed serial number, indicating that this MRG-G2000GA-1A is one of 300 such watches in the world. Price: $7,400. Alongside several beautiful manual-wind Spring Drive watches, Grand Seiko in 2019 also adds three new sporty Spring Drive models, all of which underscore the twenty-year anniversary of Spring Drive’s debut. Each new version of the movement is adjusted to enhanced precision (an incredible 0.5 seconds per day) while also being protected within a super-secure 44.5mm Zaratsu-polished titanium or gold case. All the hands on these new models are larger than those on previous Grand Seiko sports models, plus there’s more lume, better lug curvature and a new, snug-fit bracelet with thicker links. One of the two new GMT chronographs has a rose gold case (pictured) and a rich burgundy dial while the other is cased in titanium, with an interesting metallic green/brown dial. 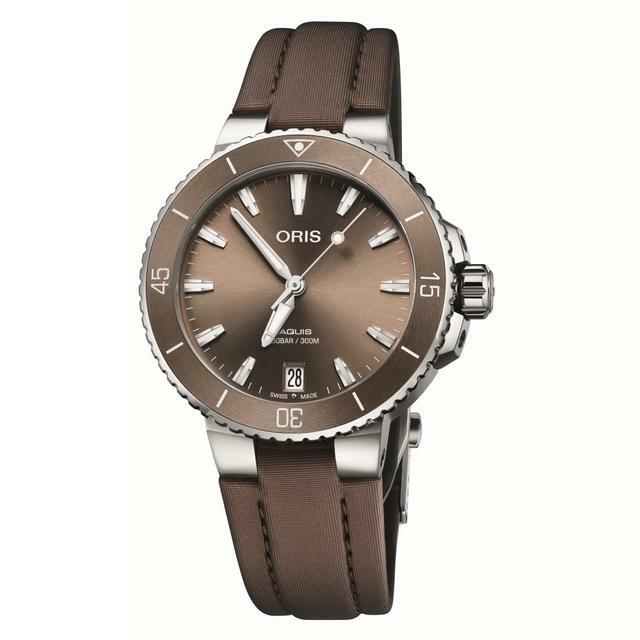 The new Oris Aquis Date with gradient brown dial is sized for smaller wrists with its 36.5mm steel case. It's also sold on a steel bracelet. 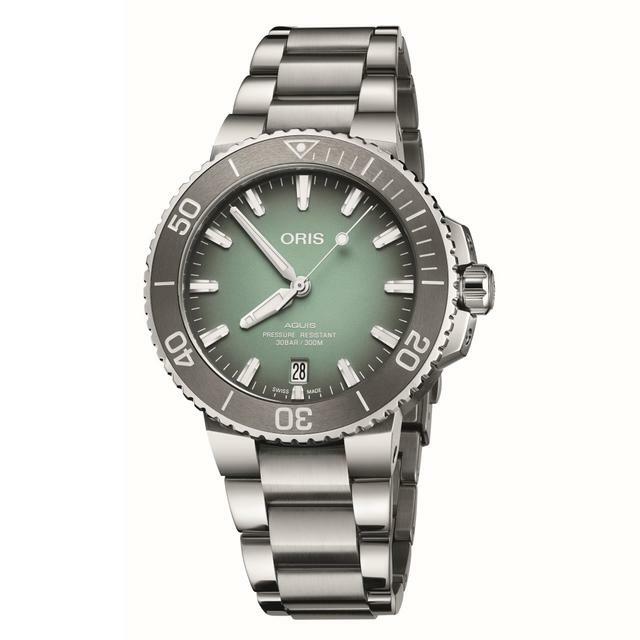 In addition to expanding its excellent vintage-inspired Diver Sixty-Five series and adding a new set of colorful Big Crown Pointer Date watches, Oris in 2019 continues to offer new, pleasing variations within its bedrock Aquis collection of affordable dive models. This year, within the mix of Aquis debuts look for new models with smaller diameter case sizes. One 36.5mm Aquis Date watch, with a fetching brown dial, is squarely aimed at women divers. A second Aquis Date model, sized for any wrist at 39.5mm in diameter, is pleasingly set with a mint-green gradient dial and a grey tungsten bezel. Both are water resistant to a full 300 meters, glow with generous SuperLuminova markers and operate with Sellita automatic movements. Prices: $1,900 and $2,100 (steel bracelet).